The statement by tribal intellectuals and activists of Assam over the ongoing controversy created by a section of human rights activists, thinkers and journalists from outside Assam against NRC update exercise, was issued in Guwahati recently. We have heard about NRC for the last few days and from so many commentators that it has become difficult to make sense. Everything seems to be repeated ad nauseam that opening newspapers or any social media site or to look at figures, raises confusions for most people. Some of the commentaries are coming from experts, but many are coming from people who are merely concerned. Some of these concerns are misplaced, some genuine and some malicious. There is no doubt that under the current political regime suspicions of malpractice is tremendous. Also, in any enumerative exercise of this magnitude the issues of error coupled with official chaos can and hassled to fears. One is reminded of the reactions of people to early census, when they were anxious about losing children, wives, castes, professions and land. So, let us be clear that NRC is a much more complicated process, which stems from a long struggle, but it is not an exercise done by a community. It is an exercise by the state which has been sanctioned by the top judiciary of the country. We cannot let our history to be charted by communal forces, and likewise we cannot allow our voices to be buried by the liberal din of concerns suddenly overflowing from the globe that buries all historical understanding of a situation. As a part and parcel of colonial administrative policy of maximising revenue by ‘developing’ what colonial capitalism viewed as ‘non-productive land’, the Commons of indigenous tribal communities of Assam were converted into an open sanctuary for ‘industrious’ peasants from east Bengal. In this process of opening up the Commons of indigenous tribes, the colonial authority found an ally in a section of caste Hindu Assamese landed elite who were too eager to get rid of the revenue burden that had come upon them because of Zamindari Land Settlement in the western part of Assam, i.e., the erstwhile undivided Goalpara district. Paper work can be a dangerous thing. Colonial India generated this concept of paperwork for everything – land, people, communities’ etc. Such legal structures were alien to the local peasantry, especially the tribal communities. The legal rigmaroles of land revenue regimes resulted in colossal land dispossession throughout the twentieth century. 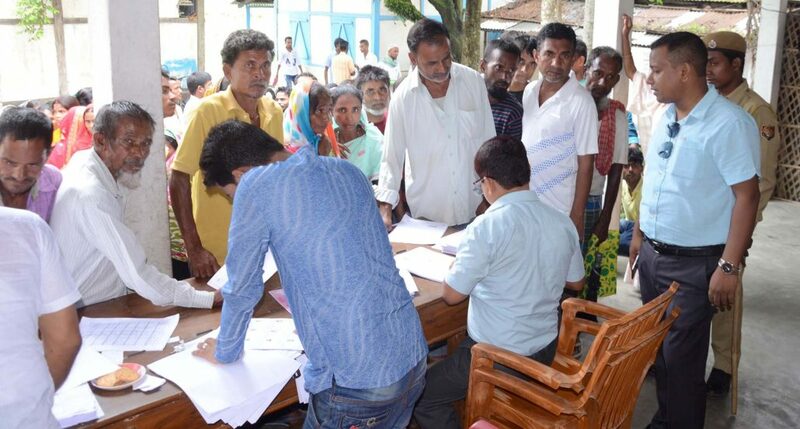 The continued loss of tribal Commons compelled their nascent middle class to form their own organizations demanding restrictions on migration, and there lies the genesis of tribal lobbying and later formation of political bodies like the Tribal League in Assam. With increased lobbying and demands from tribal political organisations the colonial administration had to introduce provisions like the Line System and later Tribal Belt and Block system to contain encroachment of the tribal Commons. These systems enacted to safeguard the tribal lands proved to be inadequate and to further compound the problem, the migration of east Bengal peasantry continued. We cannot call them illegal immigrants at that point since Bengal constituted a part of British India. Like many communities who were assisted in their movements by the British, like the Nepalese, Bengali Babus, these peasantries were offered easy terms for settlement and cultivation of the valley. The history of colonialism accommodating migrant communities in its regime is also a brutal history of land dispossession and loss of Commons. The situation got further compounded with waves of migration of refugees from East Pakistan which reached a mammoth proportion between partition of India in 1947 and formation of Bangladesh in 1971. The decision of Government of India to settle refugees in Assam was in spite of the fact that the government’s own survey conducted in 1956 showed that there were 12,00,000 absolutely landless indigenous peasants. However, while other regions of India didn’t see large scale migration except for the immediate aftermath of the partition, continued migration, to varying degrees, into Assam even after creation of Bangladesh is a reality that cannot be wished away. Today, some might argue that the existence of the tribal are well protected with all the Autonomous Councils, reservations etc. The fact that a good many tribal belts and blocks meant to protect the tribal have already been made open is not known to many or wilfully ignored. Even the rules governing the existing belts and blocks have loopholes galore. For example, theoretically, a non-tribal from any region of India can become the Chief Executive Member (the top executive) of Karbi Anglong Autonomous Council just by continuously staying 12 years there due to a faulty archaic rule made in 1952. Attempts to correct the rules are always thwarted by the Governor of Assam, which practically means the Government of Assam. The Indian mainland, beset with their own conundrums, is generally not bothered with the myriad problems faced by the tribal in Assam and the rest of the Northeast. The ruling establishment or rather the Indian state has always been apathetic to the area beyond the Chicken’s Neck. This continuous negligence on the part of the Indian state has naturally bred resentment in the minds of the people in the Northeast. This resentment has made the whole region into a continuous playing field of conflict situation. The people of Assam, both tribal and non-tribal, now have disparate histories converging on the claims of citizenship of a modern state. Is the modern state equipped to deal with the pressures generated from such aspirations? In this historical context, NRC has addressed the underbelly of migration issue in India. Where else in India has a mass of people granted citizenship after 1949? Lakhs of people who came to Assam between 19th July 1948 to 24th March 1971, who were included in the NRC draft list as per Assam Accord (Article 6 (A) of Citizenship Act). It has been designed to allay the fears of many groups within Assam. Is it a perfect solution to an issue which has been plaguing a region for decades? No, it is not. What it can do, is give a dignity to many who have lived with the slur of being an ‘illegal migrant’. According to the Census of 2011 the total population of Assam 31,169,272 and out of that, 40 lakhs do not figure in the NRC. As per the 2011 census the Bengali Hindu population of Assam is 91 lakhs which is about 29 per cent of the total population, and it is the second largest community. They form a part of the majoritarian Hindu population of the state. According to the 2011 census, there were 10,679,345 Muslims in the Indian state of Assam, forming over 34.22% of its population. It is apparent despite what some sections of public intellectuals and media have selectively focussed that lakhs and lakhs of people with ‘alleged migrant status’ have been incorporated in the list. Does that mean that somehow each and every individual of majority community and indigenous communities have been incorporated in the list? Whatever reports have been received, many people, irrespective of language, religion or ethnicity, are not in the list. How is it that when people from a certain linguistic community or religious community being left out is seen as a part of a large malicious scheme and while others being left out is seen as a simple bureaucratic error? A section of people is trying to play the Bengali sentiment against the Assamese sentiment. Hence stories are about Bengali Hindus and Bengali Muslims whose names got left out. Among others are those who are expressing angst over the issue, equating it with the experience of Nellie. Or worse, it is being equated with Nazi Germany by anyone who has an inkling of global history but none about Assam. The tribals again remain left out of the entire discourse around NRC. The ongoing process of updating of the NRC was not borne out of state benevolence; it is an outcome of long drawn struggle, a demand for justice in face of what appeared to be the loss of homeland for its own people. However, a section of national media and commentators have painted a picture that NRC is all about allaying the fears of mainstream Assamese people. We want to draw attention to the fact that it is not about the mainstream Assamese people only; the state has numerous small and big tribal groups of people who want their land, resources and livelihood to be secured within a certain legal structure. Though political schisms exist between tribal political subjectivity and forces representing Assamese ruling elites, yet both tribal and non-tribal people of Assam consider continued migration into Assam as a shared problem that must be adequately addressed. There is no correct political position to be assumed on this issue, except the one which aims at addressing long standing historical demands without resulting in mass displacement and injury to anyone. More than anything, at this particular juncture, one has to be careful about the BJP and the communal forces it is willing to unleash. It is clear that there are no ways people can be deported, especially since there are no negotiations which have happened between Bangladesh and India regarding this issue. The state, the government in power, must work constructively work towards bringing a closure to the issue, rather than attempting to reap political mileage by claiming to resolve a decade old issue. When it is clear that there are no ways people can be deported, then people in Assam should have an informed opinion about it rather than indignation. Indian government has initiated this process of updating the NRC yet without considering the situation ‘what after NRC’. Neither deportation, nor detention camps can be seen as methods of resolution. So, we appeal to all concerned people of Assam, the country and the world to recognise the peculiar predicament of Assam, all its people by trying to arrive at ways in which justice prevails with a regard for its history.